As a mommy, I am always in pursuit of new cleaning and laundry products. Enter Persil’s ProClean Collection to just make my day. In my house I have dancers and ball players which brings tons upon tons of dirty, smelly and sweaty clothes. Sometimes we have 3 outfit changes a day. I tried out “ProClean Power Liquid this week and I couldn’t be happier. It is the perfect combination of action packed stain fighting and cleaning of your everyday laundry. This detergent actually penetrates deep into your clothing for a top-notch clean! Scent options are Original (the perfect laundry smell we love it), intense fresh and sensitive skin. Size options are 25 loads $5.24, 38 loads $9.97, 64 loads $11.97 or 96 loads $17.97. 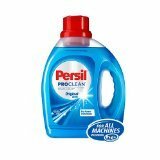 Consumer Reports rated Persil’s 2 and 1 detergent #1 and I can totally see why! A liquid soap that works on both whites and colors, is compatible with all machine types and gives you the best overall clean is a product I need in my home everyday! I saw a difference in my clothes and my son’s sports jerseys came out gleaming white! (A topic for another time is why his jersey is white to begin with). In addition, for the whites and sheets Persil brings you “Power Pearls” with a super brightness formula, while those of us who prefer the handy detergent packs can scoop up their “Power Caps”. All these fantastic items can be found at Walmart and walmart.com: http://www.walmart.com/search/?query=persil. By year’s end you will see this great product in other stores as well!